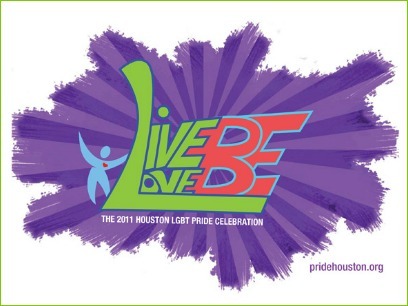 It’s that time of year again, and I can tell by clicks on posts I made about Houston Gay Pride 2009 that people are trying to find information about the 2010 events. I don’t know why “gay” isn’t in the URL, but to find out about all that’s connected with Houston Gay Pride 2010, go to www.pridehouston.org/index.php/events. 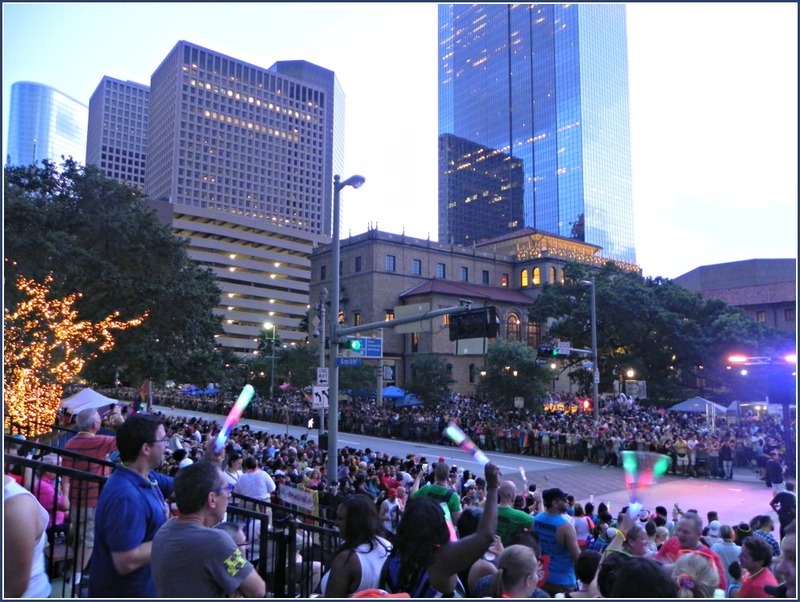 Now that it’s June, many events are starting to happen, but the biggie will be Houston’s Gay Pride Parade on Saturday, June 26th. 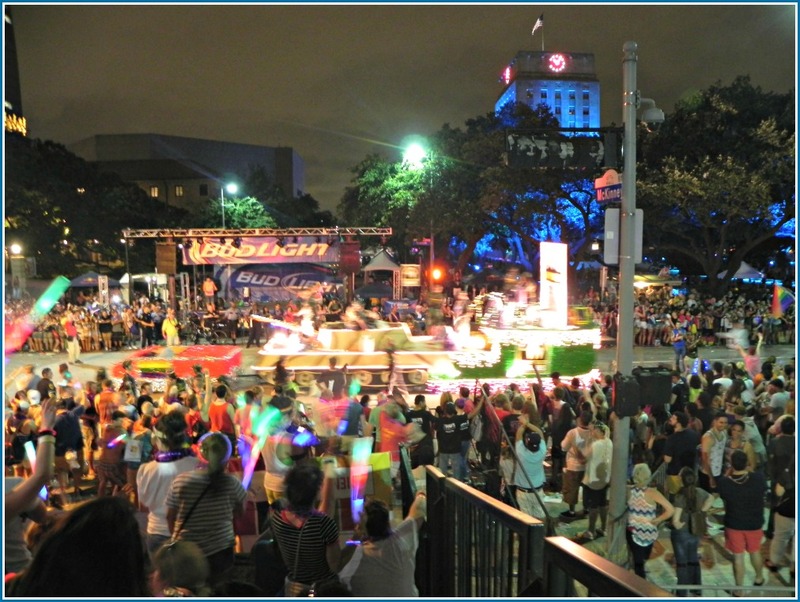 The nighttime event starts at 8 PM, going down Westheimer, starting at Dunlavy and ending at Crocker, which is just a couple blocks beyond Montrose. The theme this year is “Pride Not Prejudice”. The Pride Festival is the same day, starting at 1 PM, right in the heart of Montrose. 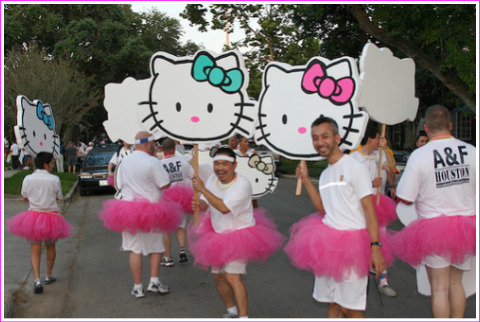 After all of the discussion about the Houston Chronicle story about the woman being trampled by a police officer’s horse at the Pride Parade and all the seeming interest in the “Hello Kitty” entry of the Gay Asians and Friends entry in the parade, I thought I needed to add another post. 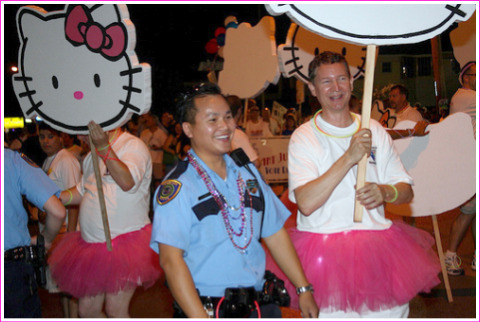 From the pictures, it’s very evident that at least one member of HPD was having the time of his life. 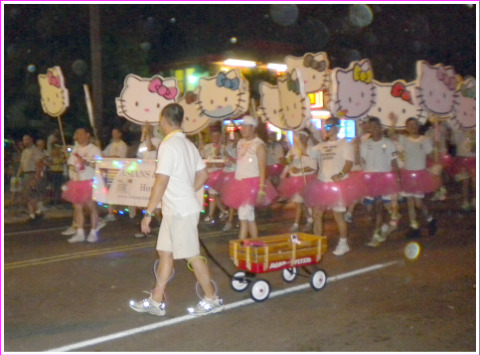 Also, the “Hello Kitty” group was one of the most unique of the whole parade. 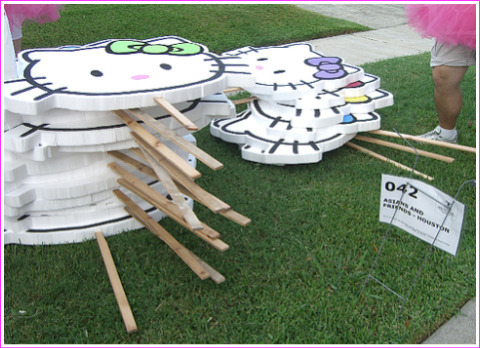 (Thanks to Asians and Friends Houston for a couple of the photos.) 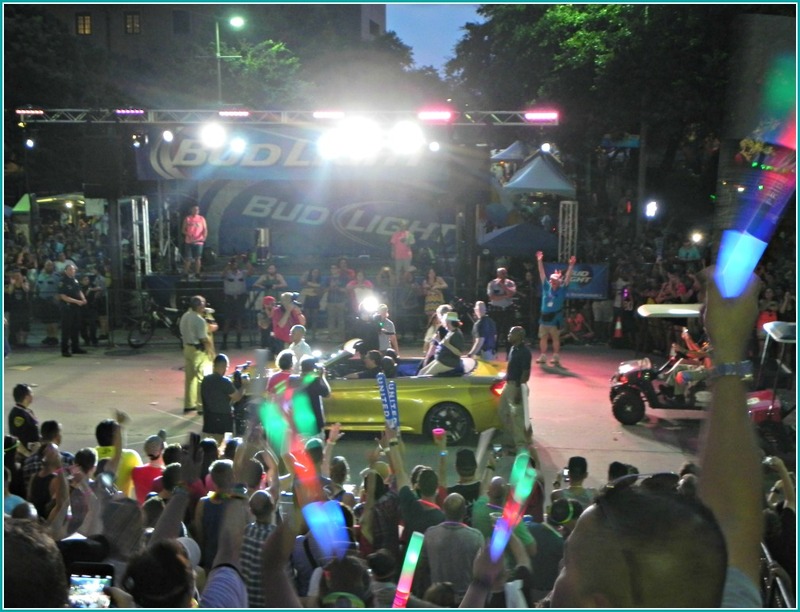 Check out more of the parade and other Houston Pride events here. Houston Police Department leads the parade, members definitely in a festive mood with sirens going and bullhorns asking for noise from the crowd. Totally positive attitude from HPD, definitely different from years ago--shows how far everyone has come. Apparently, there was a woman trampled by a police officer’s horse down near Stanford Street during the parade last night. The comments to the Chronicle article are saying all kinds of things, but I was quite a few blocks from there, so I can say nothing about what happened in that incident. However, nothing I saw done by the police last night was negative; most everything was positive and then some. 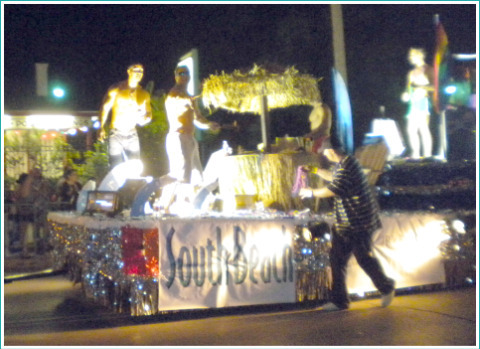 They had a great contingent leading off the parade. The head car, in fact, was one they use for recruitment and several of the officers walking alongside were gay (based on my “gaydar”). The police cars had sirens going and the lead car driver was trying to liven up the crowd, shouting things like, “Let’s make some noise” over his bullhorn. 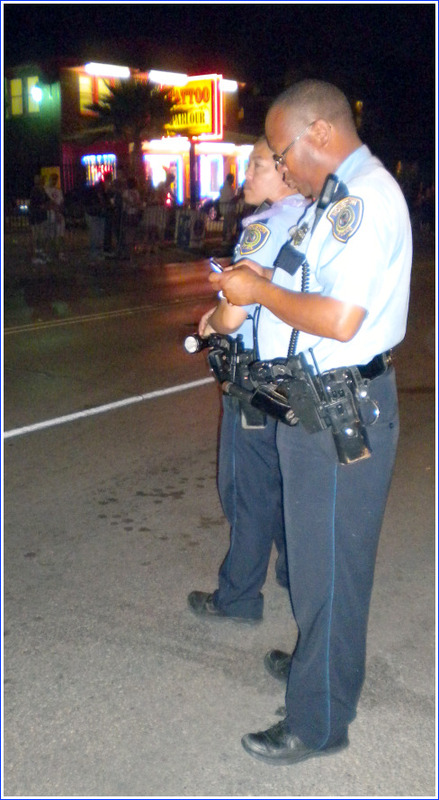 These HPD officers acted very cordially with everyone as they patrolled the parade. 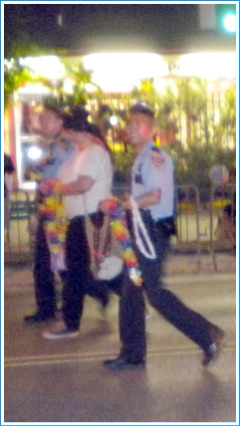 The couple of street patrol officers who were in the area where I was standing often let people cross the street between floats in nice, easy-going way. They kept people off the street, but most of the time while they were near me, they were chatting about “nothing”, not saying anything about the parade or the onlookers. One of them seemed bored, and was engrossed in text-messaging for a good, long while. I was paying attention to all that because I can’t say I always have had a “love” for the police, and sometimes at past parades, I had seen them be somewhat aggressive in their crowd control. But I thought the involvement of the police, the firefighters, and even a group of city employees says a lot about how far everyone has come since the early years of the gay pride parades. The problem is that almost every entry in the parade throws out beads or some other kind of small, cheap favor and half of the people scramble out into the street to pick up dropped ones or even go up to the float riders begging for more. On top of that, many of these same people have no sense about their own safety, because they are so intent upon getting these trinkets, and for quite a few, the alcohol factor can be added in. I thought to myself as I watched last night that I had never seen so many adults acting like children when they were going after these little bits of cheap nothings, and the meaning of the parade itself was only secondary in their frenzy to grab anything that might be tossed toward the side of the street. 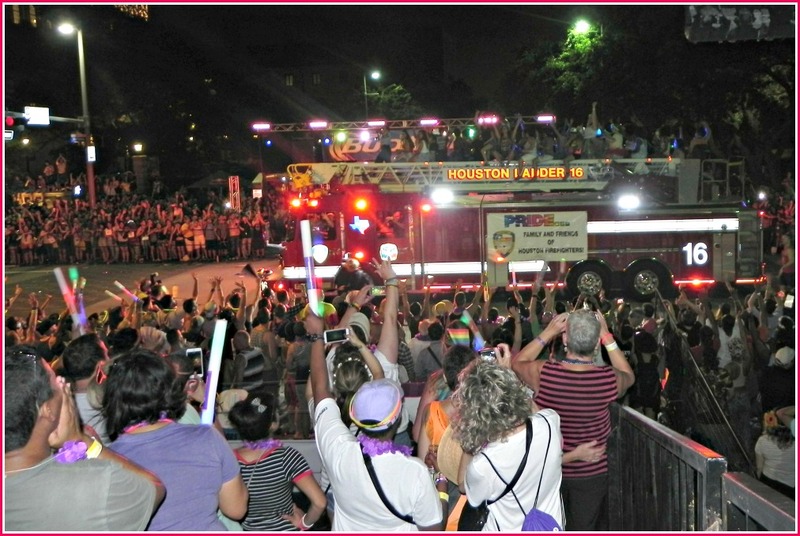 Read more about Houston’s Pride Parade here. At dusk, before the start of the parade--surrey tram bikes carrying parade-goers around. 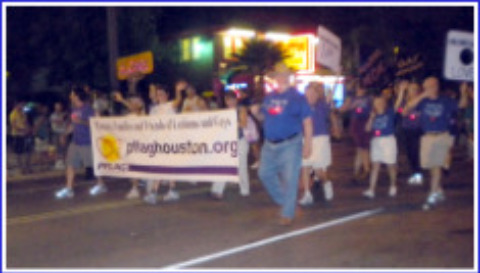 Houston’s Pride Parade took place last night ( Saturday, June 27, 2009). 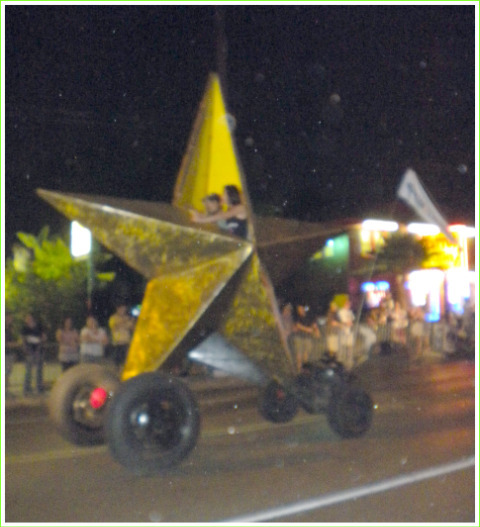 (Check out the 2010 parade here.) 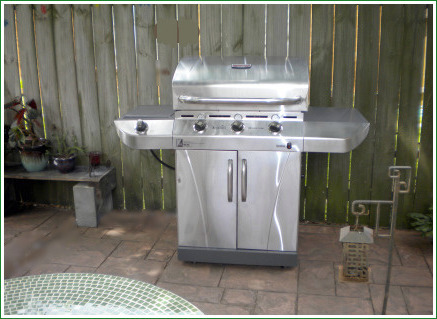 Not having gone last year, I decided to endure the heat and parking difficulties to go take it in. I’ve missed a few since my first parade in 1983, but not many. They changed through the years, but not so much. 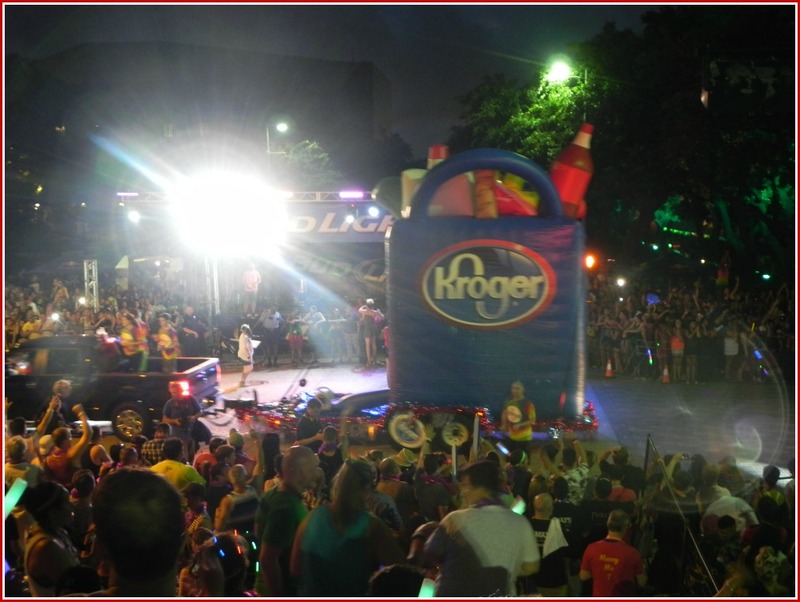 Houston’s Pride Parade is a typical parade of floats, marching groups, dignitaries, and commercial entries. Thousands of people attend, but the large majority watch from curbside rather than throng into the street as they do in some other cities. 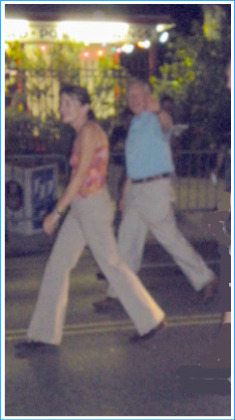 Mayor Bill White gives me a wave. 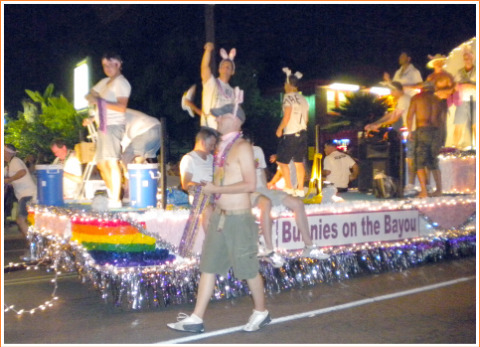 Some differences from years gone by: fewer drag queens, fewer floats with muscle guys, fewer bar-sponsored floats. 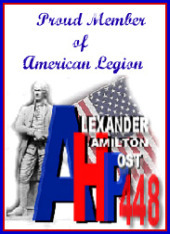 However, there are more marching groups of all kinds, more exuberant participation by public officials, police and firefighters, and many more business and corporate entries. Likewise, the atmosphere has changed. What used to be a more raucous, festive parade with heavy-beat dance music pumped from the floats (there’s still a little of that) has become a sporadic frenzy of bead-grabbing, as almost every entry has colored chains and other chucherias to toss into the crowds alongside. These crowds are definitely different from years gone by when it was mostly gays and lesbians and others of the “artsy” kind. Now it’s definitely a mixed crowd, and not exactly easy to always identify who is gay and who is straight or even “whatever”. In my opinion, though, this Mardi Gras-like bead-tossing, while definitely bringing in a wider variety of people takes something away from the parade’s significance. So many people are jostling and running for the favors thrown out that they really could care less about the significance of the organization or people throwing them the “goodies”. Maybe this attraction helps make the many non-gays in the crowds more gay accepting. I think only the future knows if this is so. 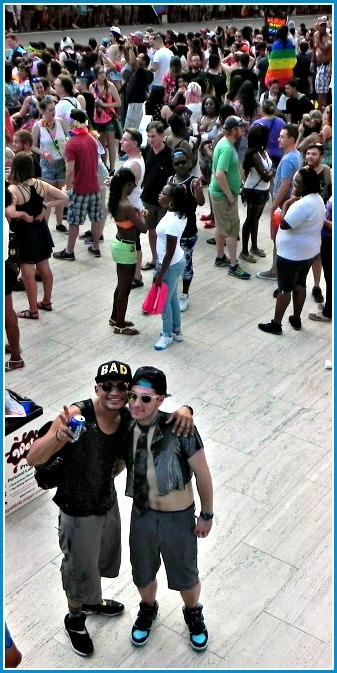 Anyway, the parade is a chance for everyone to have a good time and and enjoy the culture. Yes, it’s a culture, not a lifestyle, and a pretty fun culture if you get to know it. 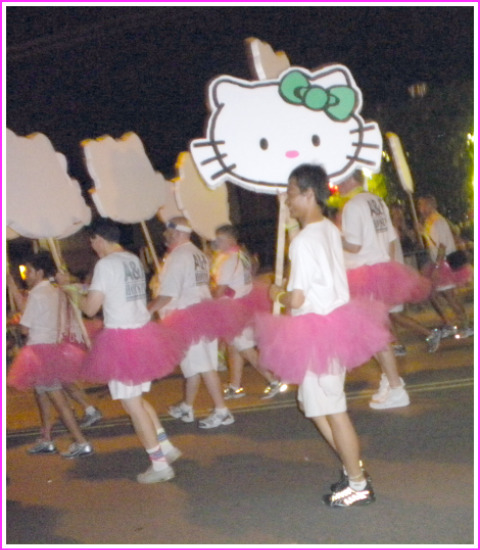 Gay Asians and Friends and "Hello Kitty"